For the “state of the art” summary of ice, snow and global change, download the UN Environmental Programme Global Outlook for Ice and Snow. This 227-page document is an excellent summary of the research on ice, snow, and global climate change. Read at least the 18-page Highlights section. Why are ice and snow important to us? Why are ice and snow changing globally? Where do scientists get evidence that the climate is changing? How can the impact of global temperature increases be determined? How do changes in snow and ice affect the rest of the environment? Why does it matter that glaciers and polar ice caps are melting? Rising sea waters change shorelines. Figure 5.25: A 1981 aerial photograph of Grinnell Glacier in Glacier National Park with indications of the approximate former extent of the glacier. This glacier has retreated from a total extent of ~2.3 square kilometers circa 1850 to ~1.1 square kilometers in 1993, and is now distributed in two major and five minor segments. 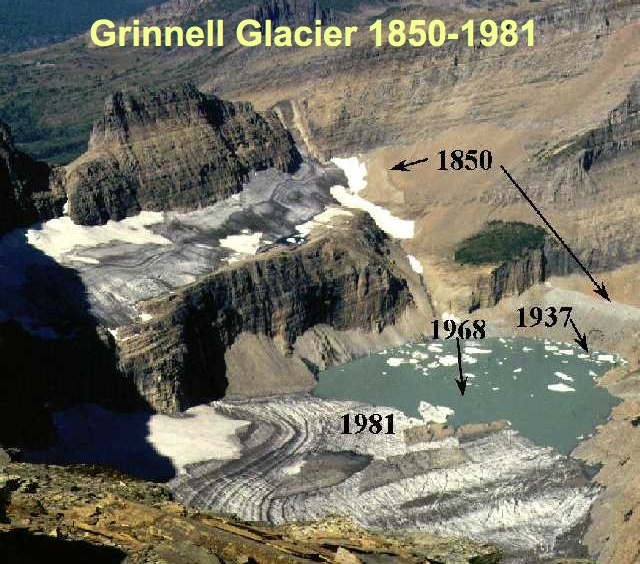 Like other glaciers in Glacier National Park, it is predicted that Grinnell Glacier will disappear by 2030 under current projections for the rate and extent of global warming.